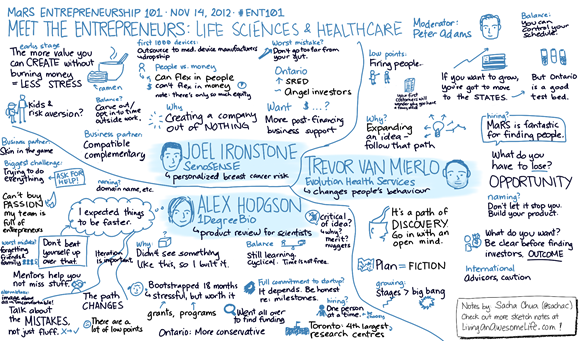 This talk is part of the free MaRS Entrepreneurship 101 series (webcast and in-person session every Wednesday). Feel free to share this! You can credit it as (c) 2012 Sacha Chua under the Creative Commons Attribution 2.5 Canada licence. Click on the image for a larger version of sketchnotes. 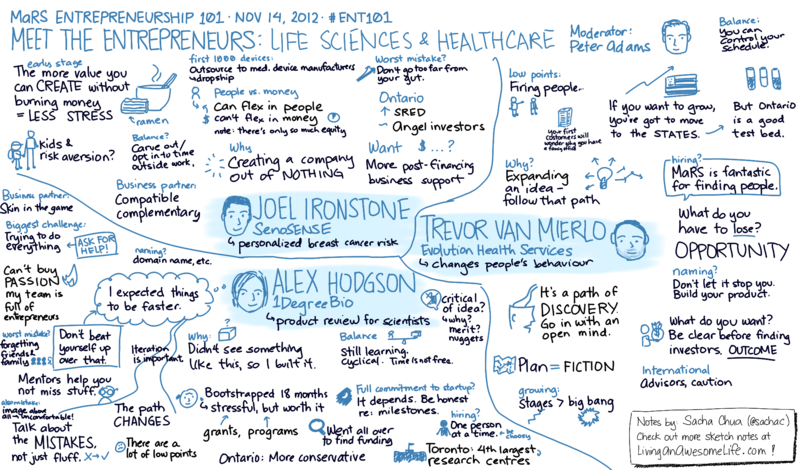 Check out my other ENT101 sketchnotes, or other sketchnotes and visual book notes! Worst mistake? Don’t go too far from your gut. Biggest challenge: Trying to do everything. ASK FOR HELP! Mentors help you not miss stuff. I expected things to be faster. Don’t beat yourself up over that . Also mistake: Image above all – uncomfortable! Talk about the MISTAKES, not just Fluff. Why: Didn’t see something like this, so I built it. If you want to grow, you’ve got to move to the STATES, but Ontario is a good test bed. It is a path of DISCOVERY. Go in with an open mind. 2014: What could I do if I showed up in a bigger way? 2004: WAAAH! Another thing I want to go to!